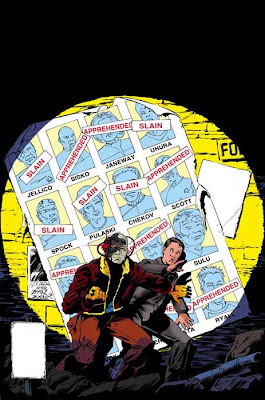 The cover is by J.K. Woodward and is a homage to the John Byrne cover for the X-men story Days of Future Past (the alternate timeline from which has been visited in the Trekverse before in the X-men crossover issue Second Contact). See the original report for a comparison to the very similar original X-men cover. I love the cover. Being an old school X-Men fan and especially that storyline I immediately spotted that one! Should be a good read. I've enjoyed most of teh new comics that have been releaed.